Tell us the story of how you got injured. I got injured riding in the mountains of North Idaho. I was going around a corner and hit a log, causing me to shift my weight for control. My foot slipped off the peg and got caught in the quad. My kill tether didn’t pull out because I used to connect them to a zip tie on my chest protector and it broke- resulting in me being drug behind it. My tibia shattered, and my fibula broke. Having to start the first race injured and just salvaging points, what goals do you have for the year? It was really hard for me to roll for points- mentally and physically. I’m still optimistic for the rest of the season though. I’m hoping to improve from last year and be up front. I have plenty of work to put in, but I’m actually excited for it. It’s crazy what we take for granted. I’m prepared to continuously push limits and work hard. Describe your move from the 400 to the 450 and what challenges you had making the transition. I had rode my dad’s 450 on and off in the past, so the transition wasn’t that bad. The biggest challenge was arm pump. The 450 can’t be controlled in the same ways the 400 could be. 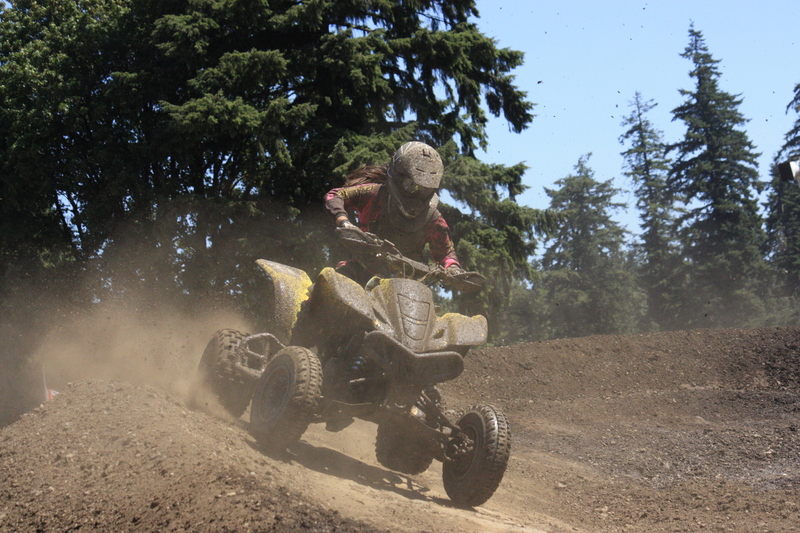 I’m a smaller person, and the 450 isn’t as easy to throw around. The switch made me retrain my muscle memory. What are your long term racing goals? One day, I would love to competitively race the WORCS series. In the nearer future, I want to win the Women’s Expert championship for QXNW. I want to eventually transition into some production classes. You didn’t really get to compete at the first two rounds, but what are your initial thoughts on the competition in your class this year? 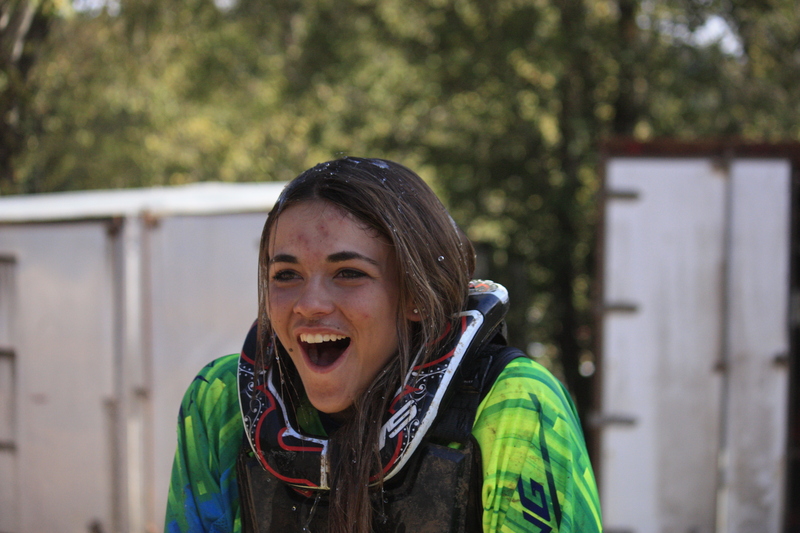 It’s always amazing to see how many competitive girls the Quadcross series has. The races are never disappointing. On the other hand, I think setting the goal to be competitive coming back from my injury is tangible. How do your mother and father fit into your race program? My mom and dad are by far the biggest supporters I’ve ever had and ever will have. They back me 100%, and I couldn’t do what I do without them. My dad taught me everything I know about riding and racing, and my mom taught me how to clean [laughs]. They both push me to be my best, and for that I’m forever grateful. If you could go back a year and give yourself some advice, what would that be? I would tell myself to have more confidence. A year ago was my very first year of motocross. Once I believed in myself, my ability sky rocketed. To be completely honest, I look up to many people in the sport for many different reasons. The majority of the people I look up to are local because I’m able to genuinely know them. I look up to John Natalie, Edico Usak, Ruby Davis, BMart, Trevor Oestreich, my dad, the Cernius clan and so many other people for various reasons. I look up to people with heart and dedication. My Grandma Craudell is my hero. My earliest riding memory is from the first time I rode independently. My dad told me I couldn’t have a quad of my own until I could control/ride a bike without training wheels. I’m pretty sure I had that skill mastered in a matter of minutes [laughs]. I remember the pride I had in my little yellow quad. Every time I rode around the small track at my grandma’s house I would give my dad a big thumbs up and go again. Can you remember your first race? My first official race was at Horn Rapids a few years ago. I was nervous to go from random mountain trails to a track, but I ended up placing first and I’ve been addicted ever since.